Capitol Dome. Under the Capitol dome in the Rotunda, June 2015. 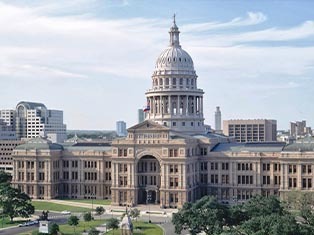 The dome makes the Capitol stand at the impressive height of 302 feet. 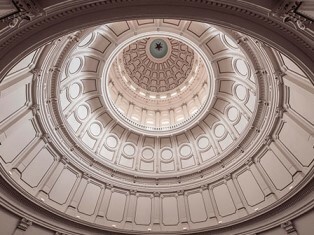 The dome rises above the roof and sits atop the four-story interior rotunda, which features thick walls of limestone designed to carry the weight of the dome above. The dome itself is a metal construction, designed as a "double dome." It has separate interior and exterior metal skins attached to either side of a structural iron frame. This gives the appearance of a solid stone dome but with much less weight. The exterior skin of the dome is heavy gauge galvanized sheet metal and cast iron. 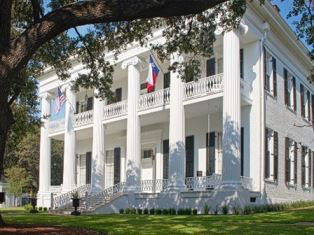 It features Corinthian columns, exterior balconies, scrolls and moldings detailed and painted to look like stone. 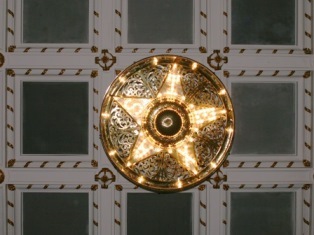 The interior dome looks more like a ceiling topped with the 8-foot wide star, surrounded by the letters "T E X A S," visible from the Rotunda floor. 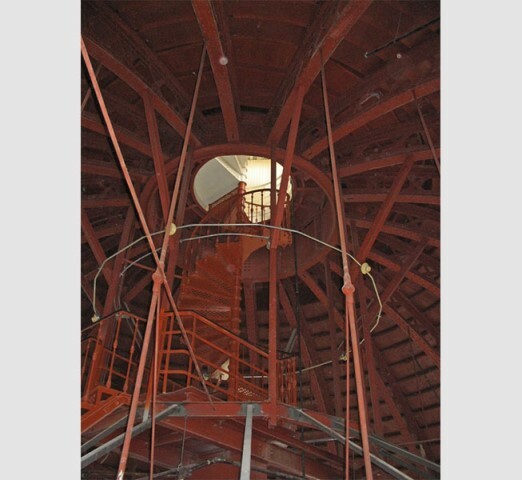 Several original spiral staircases survive in the Capitol. 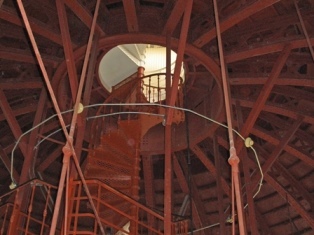 This one located in the interior dome leads to the dome lantern, the glass area directly below the Goddess of Liberty. Constructed with decorative cast-iron risers, the stairs feature rubber set in cast-iron treads and cast-iron baluster railings. 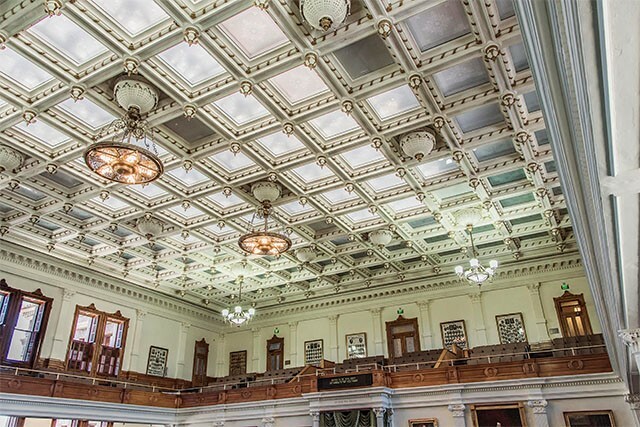 Senate Chamber Skylight, June 2015. Skylights provide natural light to the Senate Chamber. The original skylights admitted too much heat and they along with the decorative ceiling panels were blocked. The 1990s Restoration installed reproduction acid-etched tempered skylights with a Plexiglas barrier as a safety precaution in case of glass breakage. House of Representatives Chamber Chandelier, June 2015. Four large brass chandeliers hang in the House of Representatives Chamber. 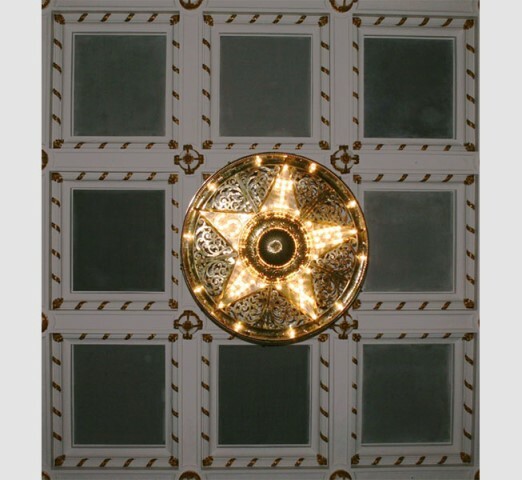 They feature light bulbs that spell out “Texas” between the points of their center star. Plaster Work. 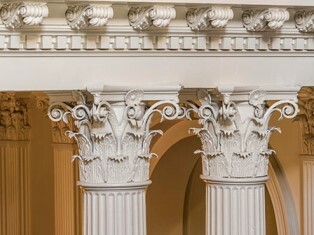 Rotunda columns above the fourth floor, June 2015. 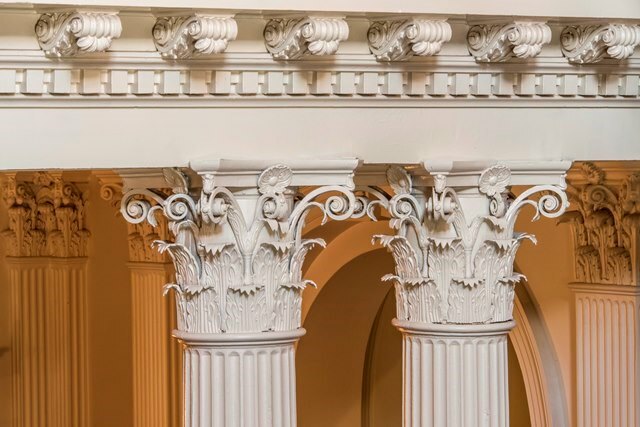 This decorative plaster work near the top of the Rotunda shows the intricacies of the Corinthian columns. 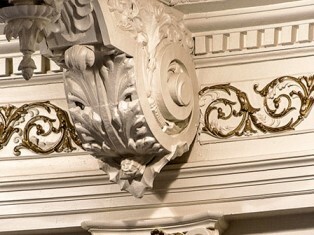 The ornate, bell-shaped capital has acanthus leaves with an elaborate cornice. 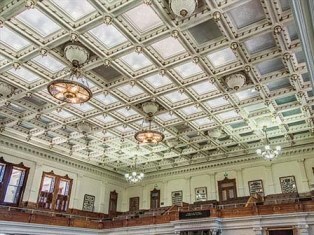 During the Capitol's first 100 years as much as a third of the original plaster cornices had been lost to dropped ceilings. During the 1990s Restoration, skilled plasterers meticulously recreated the decorative plaster detailing where it was missing or damaged. Rotunda Archway. Archway outside the Rotunda on the second floor north wing, June 2015. 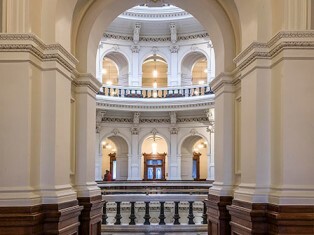 The archway on the third floor looking upward reveals the majesty of the Rotunda. 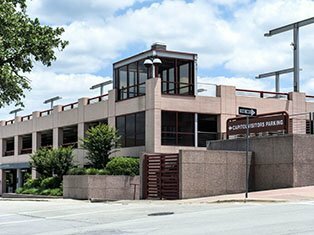 This monumental and highly-decorated area showcases one the building's most recognizable features. Open Air Seal Court, June 2015. 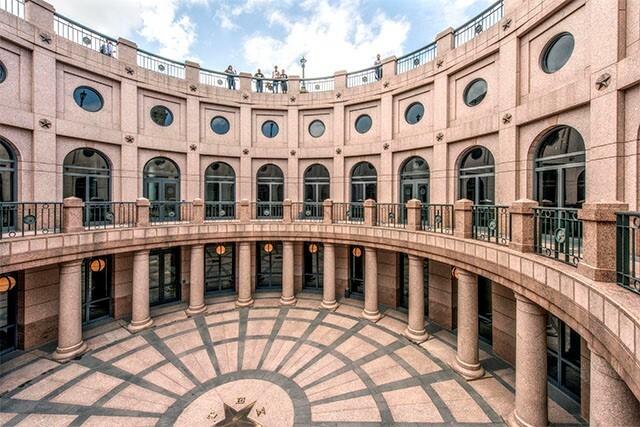 The Capitol Extension Open-Air Rotunda provides a unique perspective. It has the same diameter, 60 feet, as the Capitol Rotunda. 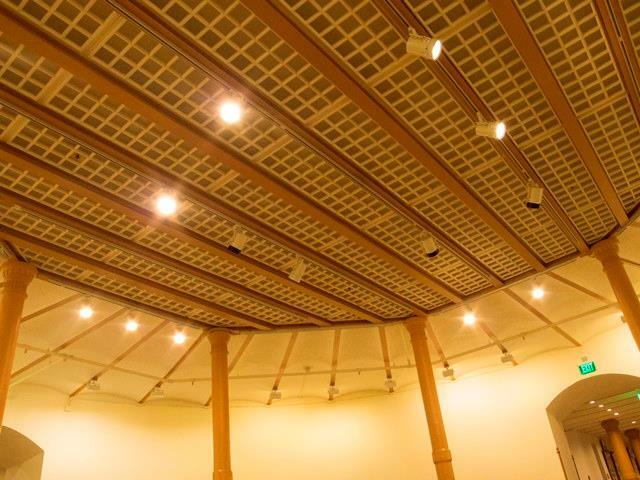 The design on the Extension Open Air Rotunda floor mirrors the Rotunda ceiling. 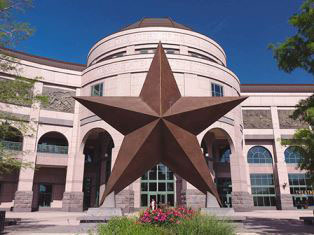 Bronze letters spell out the word "TEXAS," and surround a star, which also functions as a drain. Extension Seal Court, June 2015. 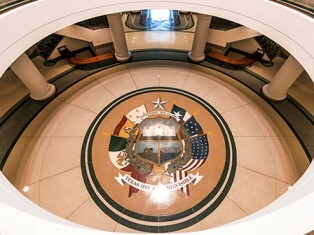 The Capitol Extension Seal Court features a handsome terrazzo floor rendition of the reverse of the Texas State Seal. 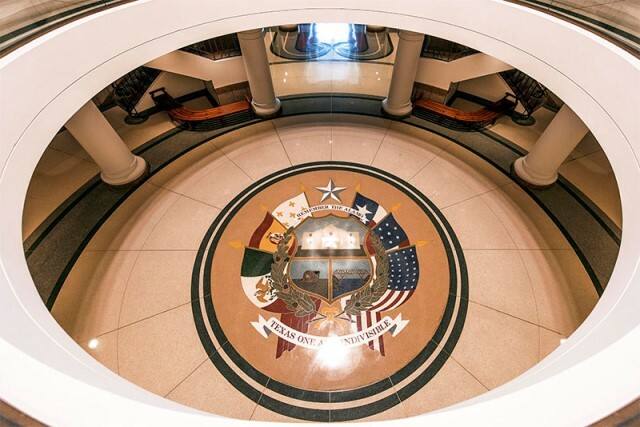 The seal includes the six national flags that have flown over Texas: the Kingdom of Spain, the Kingdom of France, the United Mexican States, the Republic of Texas, the Confederate States of America and the United States of America. 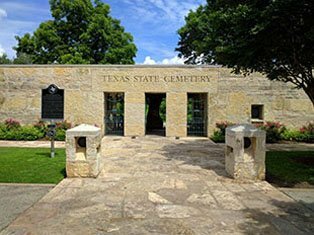 Live oak and olive branches symbolizing strength and peace stand at the center with the Lone Star proudly centered between the flags. A shield features symbols of the Texas Revolution: the Alamo, the Gonzales "Come and Take It" cannon and Vince's Bridge destroyed during the Battle of San Jacinto. 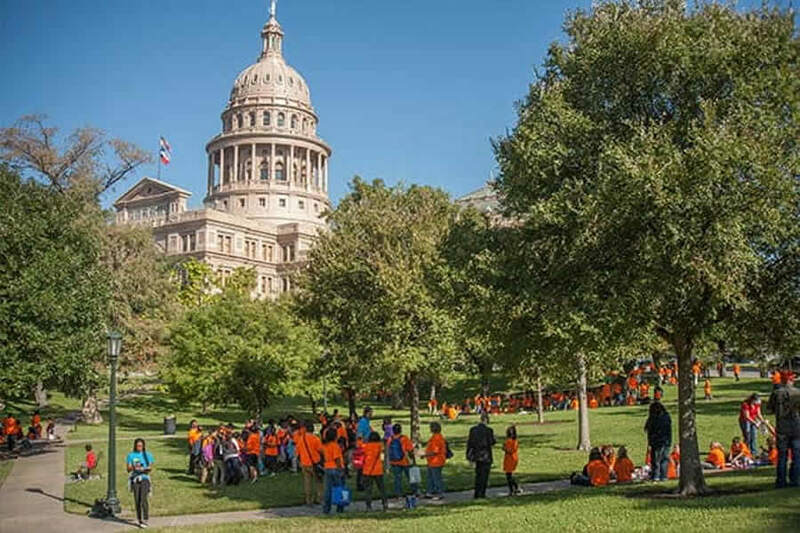 The shield includes the battle cry, "Remember the Alamo" and a line from the pledge to the state flag,"Texas One and Indivisible." Column and capital, June 2015. Sixteen cast iron columns stand in the east and west corridors on the first floor. Each column includes a cast iron capital created by pouring molten iron into molds. 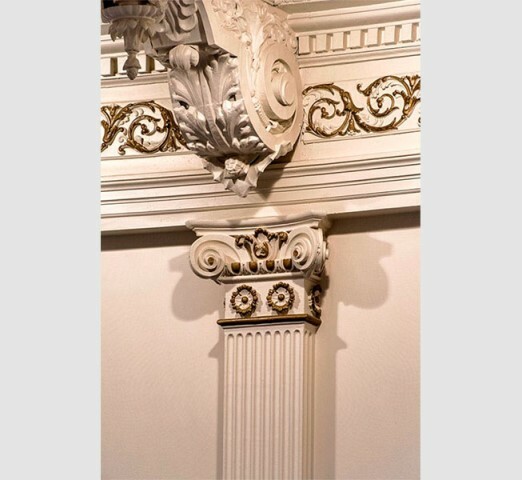 The capital includes decorative leaf elements that screw together from both sides to complete the design. Glass block floor in the Ground Floor Rotunda, September, 2015. The Rotunda originally had encaustic tile surrounding a hexagonal glass-block floor in the center. The current terrazzo floor replaced this design in 1936 as part of the Texas Centennial. 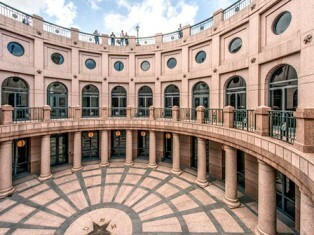 The 1990s building restoration created a replica of the glass-block floor visible from the Ground Floor, directly below the first floor Rotunda. A photograph showing the original glass block floor has yet to be located. 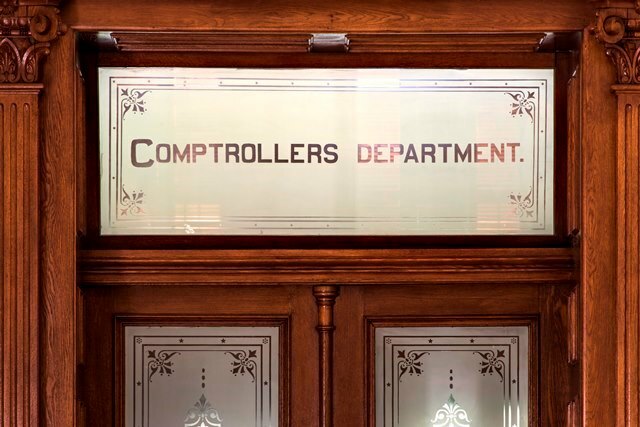 If you have knowledge of images of the Rotunda before 1936, please contact the State Preservation Board. 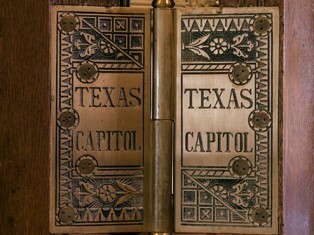 Capitol door hinge, June 2015. 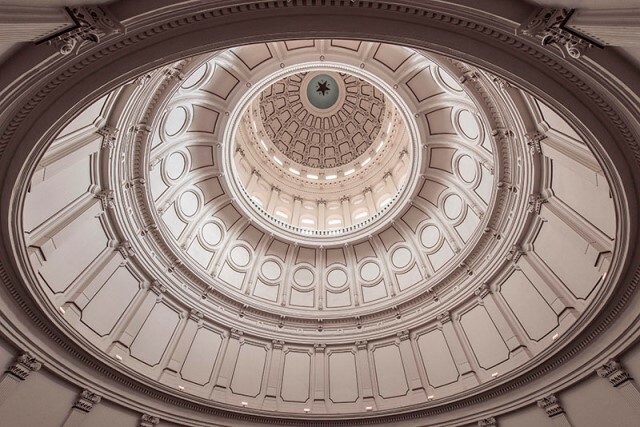 The Texas Capitol is a marvel of craftsmanship down to the smallest details. Elaborate, custom-designed bronze hinges and hardware accentuate the beautifully carved wood door frames. 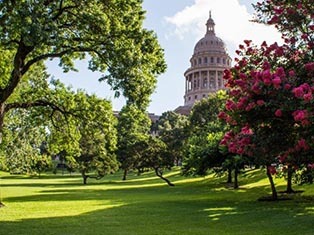 Each eight inch by eight inch hinge includes the inscription "Texas Capitol" and weights over seven pounds. The Sargent and Co. of New Haven, Connecticut created the glass molds especially for the building in the 1880s. 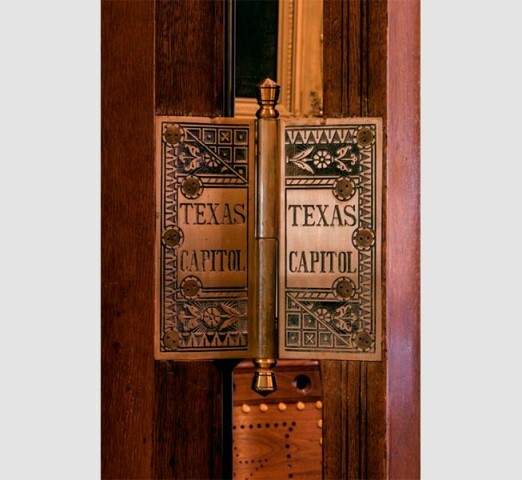 The hinges and other Capitol hardware feature incised designs of geometric and stylized floral motifs. This reflects the shift from the Renaissance Revival style of the building's interior architecture to the simpler Aesthetic Movement for its decorative details. Souvenir hunters and remodelings have necessitated the making of exact reproductions installed with security screws. 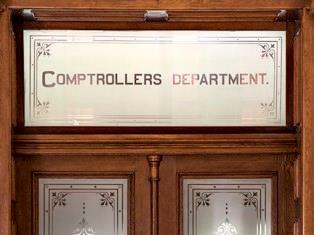 Transom outside the historic Comptroller's Office, September 2015. 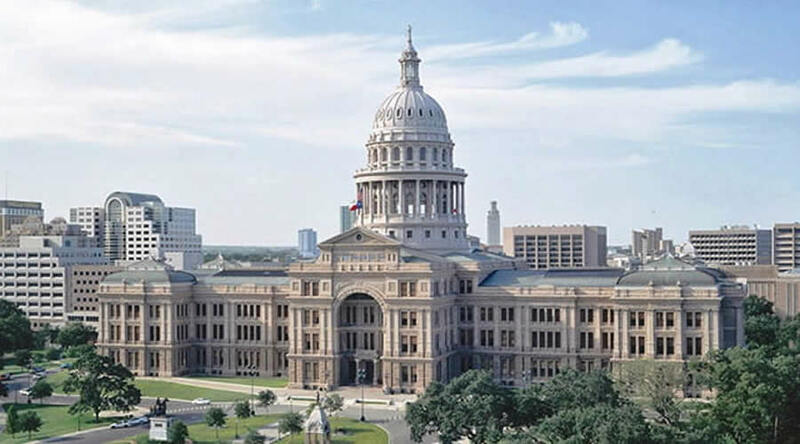 The Capitol originally housed all Texas state government departments except for the General Land Office. Etched glass transoms above the doors identified the occupants of each office. Over time, most of the departments moved out of the Capitol and transoms were removed or replaced. 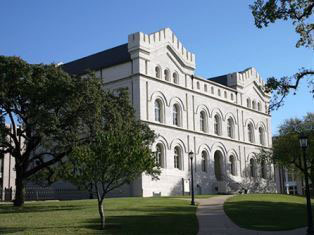 The 1990s building restoration returned transoms to their historic locations. 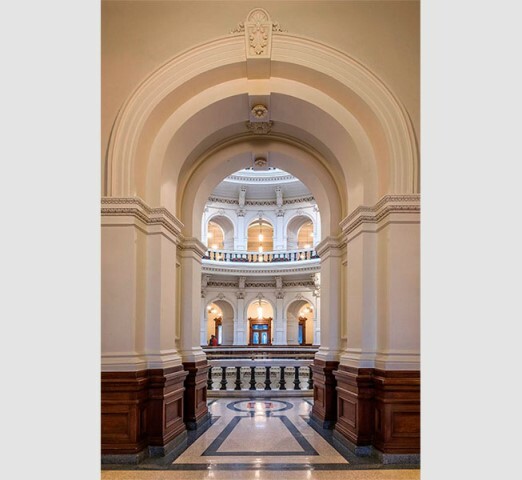 More than 20 transoms appear throughout the building designating spaces, including those areas once occupied by the Supreme Court, Agricultural Department and State Treasury.